By August 1918 Andy had been moved twice more. After three months in Limburg I went to Parchim and from there was sent to Springhesch [Springhirsch]. The latter is a “strafe” camp for N.C.O.s. Living conditions here, unspeakably disgusting. … were specially interesting because of the fact that theirs was a strafe camp for “non-com.’s” who persisted in the right to be exempt from work. Some of the “non-com.’s” stated that they had been originally in different camps but were concentrated at Springhurst because of their refusal. The camp was insanitary, and, as a matter of fact had been condemned before they were sent to it. The previous Russian internees had been relocated and the camp closed because of the appalling conditions, but it was reopened “for the benefit of the British NCO’s”. Was taken prisoner in a raid on 1/3/18. I was sent to Dulmen where I met most of the men captured on the Somme offensive. From Dulmen was sent along with other N.C.O’s to Limburg, from there to Parchim and then on to this place which is an N.C.O’s Camp called Springhirsch. I was not wounded badly enough to go into hospital, only a few scats from bursting shells – they soon healed up and at the present time I am quite well, only a bit below my normal weight but I will soon pick that up now that the food packets have started to come along. Have also received my uniform and underclothing. Red Cross parcels were finally reaching him. He probably had his German-issue blue POW uniform by this time. Cottbus, Germany. c. 1918. 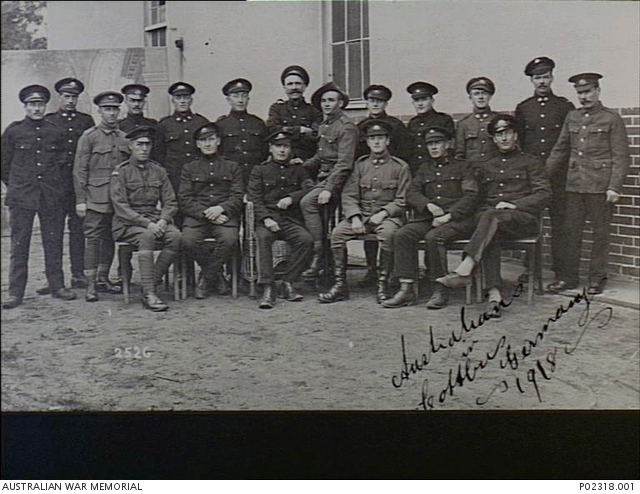 Formal group portrait of Australian prisoners of war (POW). The men are wearing a mixture of Australian Army uniform and a darker uniform and peaked hats issued by the Germans. They have been permitted to continue wearing their rank stripes, rising sun badges and awards. 1918 1st Australian Division 1 February to 7 March 1918. Statements made by prisoners of war [10th Battalion, No 157 CSM A S Duncan, No 2287 Private P M Berthelsen, No 2622 Private W B Crispe, No 5846 Private J Munday, No 5420 Private S T Noble, No 2958 Private J M Searle] AWM30 B5.37. Australian War Memorial, Canberra. 1918 157 Company Sergeant Major Andrew Steward Duncan 10th Battalion. Australian Red Cross Society Wounded and Missing, Enquiry Bureau files, 1914-18 War 1DRL/0428. Mead, A.E. Private Papers of A E Mead. Imperial War Museum collection 17232. Milner, L. 1993. Leeds Pals. South Yorkshire, England: Pen & Sword Military. ‘Principal POW camps in Germany’. The Long, Long Trail: the British Army in the Great War of 1914-1918. ‘Slang used in the trenches’. Digger History: an unofficial history of the Australian & New Zealand Armed Services. Featured image: Detail from historical map of Provinz Schleswig-Holstein 1905. Source: Bibliothek allgemeinen und praktischen Wissens für Militäranwärter Band I, 1905 / Deutsches Verlaghaus Bong & Co Berlin * Leipzig * Wien * Stuttgart. [ONLINE] Available at: http://commons.wikimedia.org. This image is in the public domain because its copyright has expired. This work is in the public domain in the United States because it was published (or registered with the U.S. Copyright Office) before January 1, 1923. Have been looking at my own grandfather’s diaries and he was in Springhirsch Camp at same time. His diary records similar detail. Interestingly i think he came back on same boat docking in Leith christmas night ! Thanks for commenting, Alison. It’s been a challenge to find detail on Springhirsch, so any morsel of information is welcome. I’m sure your grandfather, too, has an interesting story. Hello Andrew , apologies for the delay in getting back to you . Here is a summary of what was written in my grandfather’s diary , which may just give a bit more of a picture of the camp and the times they were living in. He was very understated throughout his diary about the most appalling circumstances ! My grandfather George Leslie Butler was taken prisoner on 27/3/18 between Bucquoy – Ablainezvell and Comcelles. To begin with as pow they were living in the open and had very little to eat – he describes stewing nettles , and stripping the flesh off a dead horse to make a stew. Apparently the German families gave them food whilst they were working. They marched for 2 months to a ‘distribution camp’ in Marchiennes. On 19th June he records NCO’s refusal to work , as a result of which they were shipped by train on July 9th to Ulsberg and then marched to Springhirsch …as a punishment presumably. he actually describes this as ‘comfortable’ but this was after 4 months living in the open! He describes a concert by the camp orchestra and services conducted by the German Pastor. There was obviously some sort of bathing arrangement and a library from which he was able to get a book. He thought the camp had been established for some time. In August more mail began to get through and some food parcels . Sept 5th ‘ Jerry’ described as being in a ‘bad mood’ with strafe parades nearly every day. About 150 new NCO prisoners arrive. 10th Sept marked 4 years since he left home in Manchester for Gallipoli. here were also increasing numbers of air raids over Germany – also more parcels and letters getting through. November 5th news of ‘grave disorder ‘ in Hamburg and rumours of an Armistice. trains flying red flags (?). November 11th – Armistice and they were allowed out on route marches, followed on 15th by big increase in RedCross parcels which they felt had been held back by Germans. After that he describes being out in Kaltenkirchen and selling food they received for clothes and to get money…went to Hamburg , cinema and visited a German family they made friends with in Kaltenkirchen. 15/12 train to Lubeck , and eventually Aarhus …a good reception along the way . Finally boarded SS Primula on 23/12 and experienced very rough seas en route to Leith Edinburgh . They arrived 6pm 25th disembarking the next day. Possibly the same as your great grandfather. Thanks for sharing your grandfather’s story, Alison. It sounds like he had a very different route from capture to Springhirsch. His diary entries once in the camp confirm the experiences recounted by others. Sergeant A.E. Mead’s Springhirsch diary mentions a small library from which he borrowed books. And yes, George was on the same ship as my great grandfather back to England. I hope George managed to adjust back into civilian life once he made it home.